In my previous posts, you found out what supplies I use and what plants to start inside and which ones would be just fine to start outside. Now let's take a look at the process of sowing the seeds. First of all you need to wet your organic soil mixture. I put it in the bucket, pour lukewarm water over it, and mix it with my hand. Don't soak it completely, you just want a moist soil to start your seeds in. Then fill up your pots with the soil but do not press it in tightly. This will assure a good air and water flow for the roots, which will have easier time traveling through the soil as they grow. Make two inch deep holes in each pot using your finger, each on the opposite side of the pot and place the seeds in. 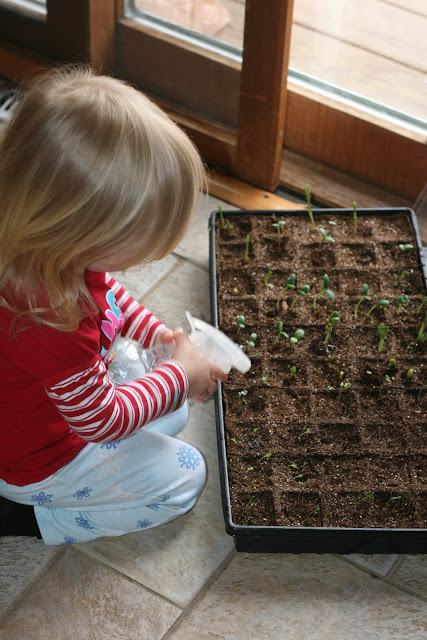 It's time to cover the seeds with a little bit of soil and mist them with water using clean spray bottle. This is very gentle on your seeds and they will not float to the surface. Use this spray bottle on a mist setting anytime you would like to water your seed. Cover the bins and place them in your green house. I place my green house by the back porch door so the seeds get some extra light and warmth (the door is facing east so the light hits it for most of the morning). The first year we started our seeds inside, we used this seed starting kit but I found it to be way too small for the roots. they didn't have enough space to grow and get strong enough to be replanted. they took a long time to adjust to the garden and some of them didn't even make it. I am glad i am inspiring someone ;-) I just put those lids on and keep them on till some sprouts appear. Then I take them off for half the day and cover them back up. 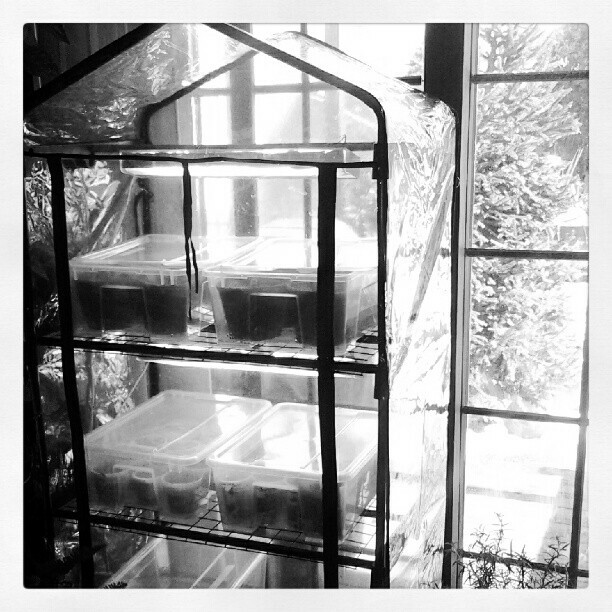 They need to breath a little but most of all they need the green house feel for the first stages of their life. Pretty soon they will be too big for me to keep the lids on so the lids go into storage and the plants remain in the green house without them. It works well, i even have to keep the green house open when it starts getting warmer around here.